If you were to judge the game by only the irons and wedges offered in your standard set of clubs, you would swear golfers aren’t meant to be successful within 100 yards of the green. The largest loft in a standard set of clubs is traditionally a 46’ to 48’ degree pitching wedge, which is a great tool to have in your bag, but is really best designed for shots between 110 – 140 yards. Fortunately, there are some great wedges you can slowly add to your inventory that will seriously improve your short game. Even professionals tend to have between five to eight high loft wedges in their bags. You don’t need to be a pro to master your wedge game, and you certainly don’t need to rush out and buy eight new clubs. Too often golfers are using a pitching wedge for shots that are better positioned for a gap wedge. The only issue being the gap wedge isn’t a typical club in your standard golf inventory. When your ball is 100 yards from the green, you really need to control your swing if using a pitching wedge, or you’re going to put the ball too far. Alternatively, fear of killing the ball and sending it over the green causes some golfers to pull up short. Deciding to add a gap wedge to your bag will allow you to take full swings from 90 – 120 yards out, and offer the opportunity for a more accurate shot. When used properly, your gap wedge will put the ball high and land it tight to the pin. Many golfers have a sand wedge at their disposal. Unfortunately, too many golfers use this wedge exclusively for shots out of the bunker. Your 56’ or sand wedge is one of the most valuable clubs in your bag when within 100 yards of the pin. With the proper swing, you should be able to get the distance you need, with enough loft and spin to drop your ball straight into its landing zone. If you don’t have a 56’ or sand wedge, adding one to your inventory could really pay dividends for shots within 100 yards. 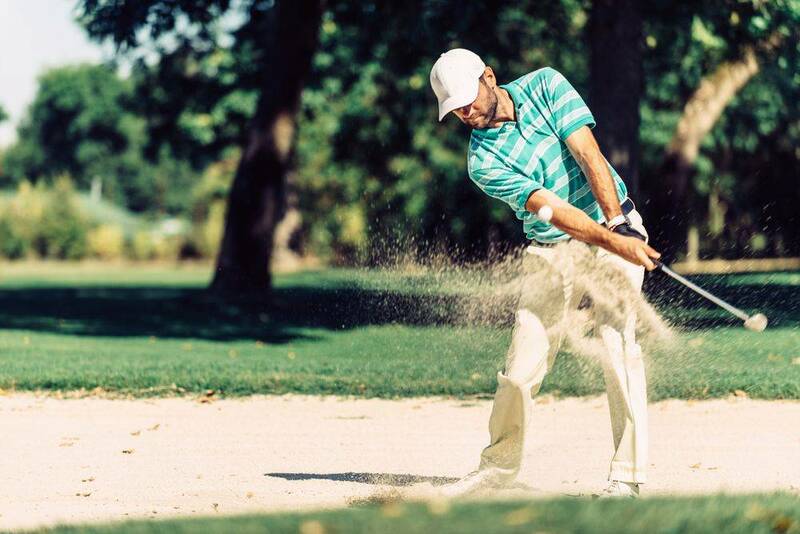 If you already own a 56’ or sand wedge, but only touch it when you’re in bunker trouble, it’s time to start letting it work for you from the fairway and the rough. The lob wedge is one of the most overlooked clubs available. Lob wedges offer the most loft of any club, most measuring in between 58’ and 60’ degrees, with some even angling loft up to 65’ degrees. Along with being a great club for taking a full swing within 75 yards, the lob wedge is a helpful weapon for getting out of trouble. Due to its short length, combined with a hefty loft, the lob wedge allows you to drive the ball straight up into the air with lots of spin if needed. Having the ability to clear obstacles such as bushes, bunkers, trees and water hazards, especially when you’re within proximity of the green, makes a huge difference in anyone’s game. When selecting additional wedges to bring into your arsenal, be conscious of what’s currently in your bag. Double check the lofts on your clubs, and add the tools that are missing. There’s no sense in buying a 53’ gap wedge if your sand wedge is only 54’. If you take the time and choose correctly, adding some extra wedges is a great investment into your game. You’ll become better at managing the course, and gain a better understanding of yardage in accordance to all of your clubs. Most of all, you’ll lower your score. Check out the inventory at our pro shop, or schedule some lessons with our golf pro. You’ll be mastering your wedges in no time.